Please note that not all services (i.e. massages, facials, restaurant and juice bar.) may be available during overnight hours. We apologize for any inconvenience. Please call us for additional information and availability. Entrance fee is additional to any body scrubs, massages and facials, resturant and juice bar. NO POOL AT THIS LOCATION. The red clay room is a sauna room that is made out of more traditional materials like Korean red clay, sage bush, and straw. Like other sauna rooms, the red clay room helps purify the body by opening up the pores and removing harmful toxins. The salt room is a sauna room specially made with salt rocks from the Himalayas. The salt room sauna is believed to have numerous health benefits including improved bone strength, which can help alleviate osteoporosis and menopause. The Korean dry sauna utilizes dry heat rather than hot steam. Some benefits of dry sauna include: improved blood circulation, increased metabolism, purified skin, and relaxed muscles and joints. The extreme heat can also increase the metabolic rate, which promotes weight loss. Dry saunas are especially popular in Scandinavian countries where a sauna session is typically followed by an ice cold shower or bath. The steam sauna soothes the body and mind. The peaceful atmosphere of the steam sauna is highly relaxing and helps purify and detox the body. The warm steam opens up the airways, which reduces congestion and helps you breathe better. The steam also helps relieve pressure around the mucous membranes. This sauna is especially beneficial to those who suffer from asthma and bronchitis, as it helps with sinus relief. Cold tubs have various benefits and are recognized, in many cases, for having pain-relieving effects. In-patients undergoing strength training and hydrotherapy, for example, have been found to have greater recovery times. Additionally, staying in hot tubs has been found to improve blood sugar levels in patients with diabetes and low blood pressure. There's nothing quite like a Korean body scrub to make you feel rejuvenated and whole again. This Korean style full-body exfoliating scrub removes deep-seated dirt and toxins that normally cannot be removed from just bathing or showering. It leaves your skin feeling silky smooth, soft, and simply beautiful. Before you begin your body scrub, you must first shower in one of our gender-segregated shower facilities. This is to ensure the cleanliness of our facility, the safety of our workers, and the overall effectiveness of your body scrub. 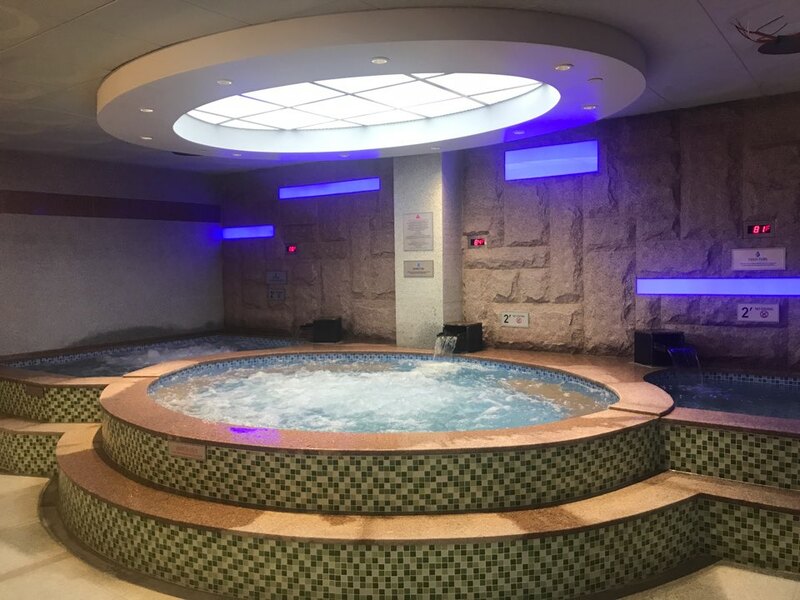 We then ask our clients to enter either the steam sauna or the hot tub in order to put their minds at ease and to open up their pores, which is essential to the body scrub procedure. Our body scrub therapists then work to rinse and wash your body further before they start to exfoliate your skin using special scrubbing mitts. Clients also have the option to get a full-body massage along with their body scrub, which also includes a cucumber face mask and a face cleanse. So what exactly is a face cleanse? Essentially, face masks simply work better if your face is both wet and clean. Our expert body scrub therapists apply a Korean face cleanser to your skin. They make sure to gently massage your face while applying the cleanser for full effect. They then cover your face with a hot towel, and the steam from the towel helps to open up your pores, which in turn helps to pull out the difficult and deep seated dirt in your skin. Once your face is clean, they apply a cool and refreshing cucumber face mask, which will moisturize your skin and leave you feeling positively glowing. PKG 1. body scrub with shampoo $60 + $10(Tip-Cash Only). 35 mins. PKG 2. body scrub with massage & hair shampoo (Included: face clean, collagen mask) $90+ $20(Tip-Cash Only). 1 hour. PKG 3. body scrub with massage & hair shampoo (Included: face clean, collagen mask) $120+ $25(Tip-Cash Only). 1 hour 20 mins. PKG 4. body scrub with massage & hair shampoo (Included: face clean, collagen mask, aroma oil massage) $140+ $30(Tip-Cash Only). 1 hour 35 mins. PKG 5. body scrub with shampoo, face cleaning with seaweed mask 1 hour seaweed massage $180 + $45(Tip-Cash Only). PKG 1. body scrub with shampoo $60+ $10(Tip-Cash Only). 35 mins. PKG 2. body scrub with shampoo, face cleanse, and face mask $90+ $20(Tip-Cash Only). 1 hour. PKG 3. body scrub with shampoo, face cleanse, and face mask $140+ $30(Tip-Cash Only). 1 hour massage. PKG 2. Admission, Body scrub with massage, shampoo, face cleanse, and collagen mask $370 + $74(Tip-Cash Only) also includes 2 vouchers for the juice bar, respectively. TWO FEMALE STAFFS PERFORM SERVICE, MEN COVER PRIVATE PARTS. Instantly revive dull, tired looking skin and improve overall skin health, texture, and tone. Our services will help combat the effects of aging and make you look and feel beautiful. We have treatments available for all skin types. What is a facial anyway, and why do I need one? A facial is a body of procedures done to improve the look and health of your skin. The highest quality creams you apply at home are simply not as effective if your pores are clogged and your skin is poorly managed. Our highly-skilled aestheticians will expertly treat your skin according to the highest standards. Kyung-Rak Facial Please stay tuned for more details. Enjoy a tailored nurturing and comforting service to promote circulation, enhance lymphatic drainage, and relieve tension caused by stress. A widely accepted medical treatment for lymphedema and poor blood circulation. It’s been claimed that a 30min treatment is equivalent to a 5min walk. This treatment is excellent for cellulite, weight loss, increased circulation, and to relieved tired legs. Using our signature blend of essential oil combined with our Thermo Sauna machine will rejuvenate your skin while giving you the results you want! Deep Detox / Circulation And Drainage / Slimming & Cellulit A complete anti aging treatment for skin lacking nutrients, moisture and elasticity. Active ingredients help restore cellular communication and slow down the degenerative process. Feet are soaked, scrubbed, and washed to relax muscles and stimulate blood circulation for a refreshed feeling. Then using the thumbs and fingers, the relevant reflex points, pain and other symptoms are treated to alleviate the corresponding areas of the body. Combining both ancient and contemporary East Asian aromas, our oriental room is personalized to bring balance and equilibrium to body, mind and soul. Experience rejuvenation in a setting of complete tranquility.